Acne pathogenesis is a multifactorial process that occurs at the level of the pilosebaceous unit. 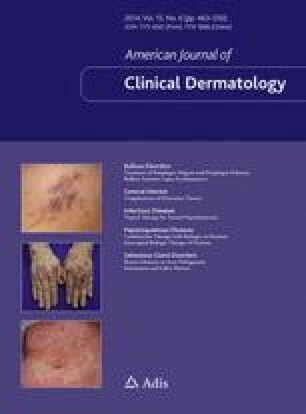 While acne was previously perceived as an infectious disease, recent data have clarified it as an inflammatory process in which Propionibacterium acnes and innate immunity play critical roles in propagating abnormal hyperkeratinization and inflammation. Alterations in sebum composition, and increased sensitivity to androgens, also play roles in the inflammatory process. A stepwise approach to acne management utilizes topical agents for mild to moderate acne (topical retinoid as mainstay ± topical antibiotics) and escalation to oral agents for more resistant cases (oral antibiotics or hormonal agents in conjunction with a topical retinoid or oral isotretinoin alone for severe acne). Concerns over antibiotic resistance and the safety issues associated with isotretinoin have prompted further research into alternative medications and devices for the treatment of acne. Radiofrequency, laser, and light treatments have demonstrated modest improvement for inflammatory acne (with blue-light photodynamic therapy being the only US FDA-approved treatment). However, limitations in study design and patient follow-up render these modalities as adjuncts rather than standalone options. This review will update readers on the latest advancements in our understanding of acne pathogenesis and treatment, with emphasis on emerging treatment options that can help improve patient outcomes. Neither Dr Reynolds nor Dr Das has any conflicts of interest to declare.